Fiona and her brother Samson came to live with me in the spring of 1992, just after I bought my house, and five weeks after she was born. Samson was killed in a traffic accident later that summer, which we both found devastating, but Fiona learned from that to avoid cars and to stay out of the road. If only humans were so trainable. Aggressively affectionate with humans, Fiona was loved by all, except me when she indulged in her habit of sitting on my keyboard to get my attention while I was trying to accomplish something. She was the only cat I ever knew who wanted to get petted before she got fed. Of course, she always wanted to get fed. 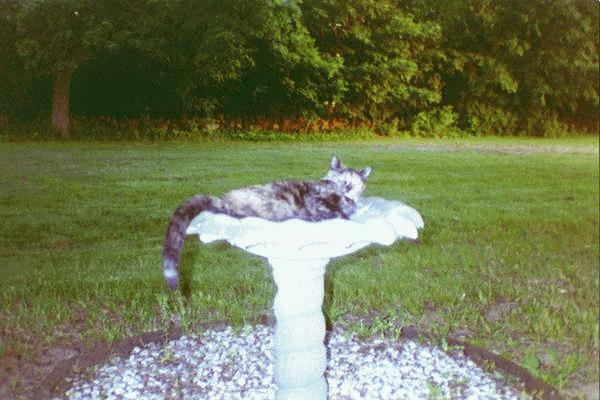 Here we see her in one of her favorite lurking places, the old birdbath in the back yard. She would sit here, hoping I would find her irresistibly cute and would come and pet her for a few hours. 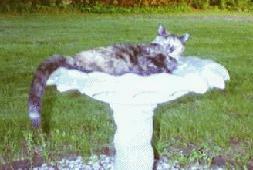 When I wasn't in sight, Fiona would lurk in the birdbath, watching for her bird and squirrel friends, hoping someone would come and play with her. When she did find someone to play with, such as some nice little mouse, she would play catch with them, repeatedly tossing them high into the air, having bitten them only hard enough to keep them from running away, but not hard enough to kill them. Very charming. Unlike most cats, Fiona never tired of being petted, no matter how long it went on. This is an appealing trait only in cats who live with other people. When you wanted to stop petting her, Fiona would politely (for a cat) insist that you continue, sometimes using her needle-sharp claws to urge the return of your hand to the sweet spot just behind her jaw. If you did not happen to be petting her at any given moment in which she was awake and not eating something, Fiona would climb into your lap or sit on whatever you were reading or working on, confidently expecting that you would notice her and realize you were neglecting your petting duties. If after repeated attempts to decline these requests for attention (by dumping her on the floor, for example), you finally shut her out of the room in exasperation, Fiona would sit just outside the door and commence a lengthy commentary on this shameful behavior in a hoarse, quavery monotone better suited for frightening small children. This happened at any hour of the day or night. See why I said this trait is appealing only in cats who live with other people? If I had a degree in feline psychology, I might theorize that Fiona was suffering from abandonment issues brought on by being taken from her mother too early, and then while still a little kitten seeing her beloved brother, her constant companion and playmate, brutally murdered by an errant truck right before her eyes. Fiona was further traumatized later when certain ex-roommates heartlessly kidnapped her other cat friends when they moved out, somehow inexplicably assuming that because they brought these cats, they had the right to take them away, too. Not being a cat shrink, however, I can only say that I never saw a cat that wanted so much attention. Ah, but lying in the recliner with Fiona warming my chest, her whiskers tickling my nose, gazing inscrutably into my eyes with those shocking alien eyes of hers, with the late afternoon sun turning the living room a warm golden hue, and the thunderous sound of her purring filling my ears, all our differences of opinion mattered not a bit. Sadly, Fiona has not been seen in these parts since August 29, 1996. I hope she is happy, wherever she is.